There has been a Lync News client for Android for at least a year now. It has kind of sucked and I’ve always been a bit embarrassed by it. It was done using AppMakr and while it technically worked it looked more like what 90’s-era GeoCities looked like in App form. It looked even worse on a tablet. Last night I published a brand spanking new version of Lync News for Android. It even got a name change to Lync News 2013! If you are eager to give it a shot and don’t care about the new features below, then by all means click here to download it from the Google Store. 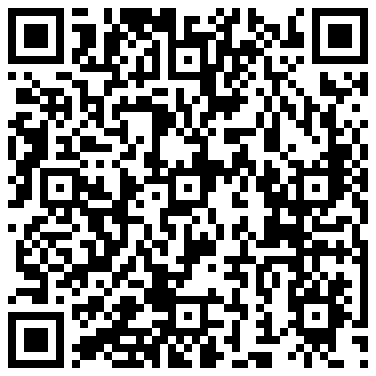 You could also scan this handy QR code directly from your device. 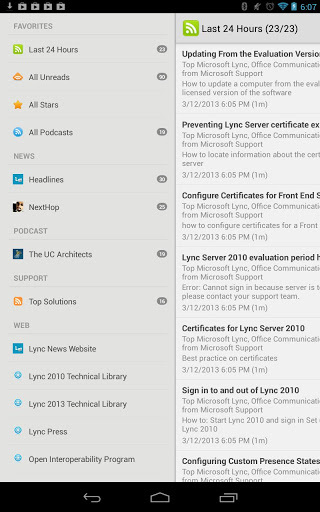 As always, the main driving force behind the app is the Lync News Aggregator (of DOOM!) that pulls in rss feeds from over 90 blogs and sites around the world to present the latest news, articles and tech writings covering the world of Lync. New to this app is some level of article management. This app has the unique feature of showing you a listing of new articles within the past 24 hours making it easy to see what you have missed in the last day or so. It also keeps track of unread articles so you can keep track of articles you may have missed for some reason. If you find an article particularly compelling, you can “star” that article and then at some later time you can refer back to your favorite articles. It’s a simple way to build a personalized library of articles valuable to you. A link to the official Microsoft NextHop feed is available. This was specifically added so that you can keep an eye on new articles directly from Microsoft. Note that NextHop is also one of the 90+ sites in the aggregator (of DOOM!) so there is some redundancy here. However, I felt it was important to highlight Microsoft’s official channel. If you are already subscribed to The UC Architects valuable podcasts via some other means then this next section in the app may be irrelevant to you. But for those of you unaware of the podcast, it has its own section here. You can easily keep up with the latest episodes of the podcasts and either stream them directly from the app or download them for later listening pleasure. The Microsoft Lync Server Top Solutions RSS feed contains the answers our engineers use to resolve many top support calls. The Top Solutions feed pairs the latest top customer issues with the best Microsoft resolutions from KB articles, blogs, TechNet and MSDN. The RSS feed also keep you ahead of the curve by alerting you to potential problems and linking you directly to resolutions that can help avoid them. Finally there are several web links to some of the top Lync resources. Of course, you can get to the Lync News website – which I admit is a bit self serving. However there are some more useful links such as those directly to the Microsoft Lync Technet documentation and to the Open Interoperabtility Program for Lync. I’ve also added a link to the Remote Connectivity Analyzer which allows you to test your Lync Edge settings (as well as Exchange and OCS). Instead of Googling (or Binging) for those resources they are now one touch away. Lync Press is a paper.li daily “newspaper” that aggregates everything from Lync News as well as from Twitter, Youtube, and a few other sources. This allows you to see the most important happenings in the Lync world from the past day or so. It’s a neat alternate view to the Lync News aggregator bolstered by some additional resources. You can change the look of the app from a light-colored layout to a dark one. You can also control how often the app checks in the background for updates. I have set this to 4 hours but you can modify it down to as low as every 15 minutes. If you’ve read this far, good for you. It is now the time when I admit that I didn’t write any of this but instead used www.appyet.com to create this version. So here is a shout out to the fine folks at App.Yet?! It’s a pretty cool framework for code-less app generation. Please leave any comments or requests below.